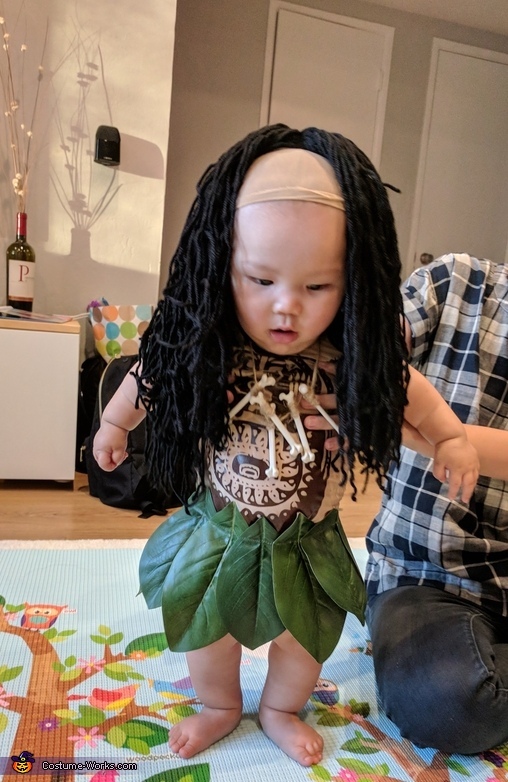 My daughter wanted to be baby Moana for this Halloween, so I made this costume at the last minute for my 6 month old son. Onsie: I used sheer leotard fabric to create a onsie and added some snaps on the bottom so it'd be easy to take on/off. Then traced Maui's tattoo's on my computer and cut it out/ironed it onto the onsie. Skirt: I went to my local Michaels and bought a fake leaf decor. Then I pulled off all the leaves and sewed them individually onto a piece of elastic. necklace: I found some bone decor at my local party store and used hemp to create the necklace. wig: Again, I used the leftover sheer fabric and sewed it into a cap. Then I took 1 ball of black yarn and made 20-30 bunches. Then I sewed each bunch onto the cap. hook: I found an image of a polynesian hook online and traced/cut it using my silhouette machine. Then I ironed it onto a piece of cardboard and cut it out. I used leftover hemp to wrap around the bottom for the final touch.